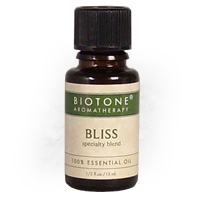 Biotone Bliss Essential Oil Blend is 100% Pure. Blend of Ylang Ylang, Black Pepper and Clove essential oils. Warm and spicy, promotes a sense of ease.